The sweet pastel colors in this quilt make it perfect for your favorite little one. 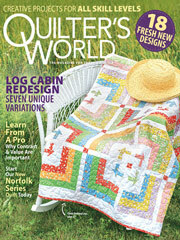 This free quilting pattern is available in three sizes. Make it as a baby blanket and it would be perfect for a homemade baby shower gift. Choose which size you want to make and start stitching. Finished sizes: Block (7 1/2" x 7 1/2"), Crib (32" x 44"), Youth (56" x 74") and Twin (65" x 83").